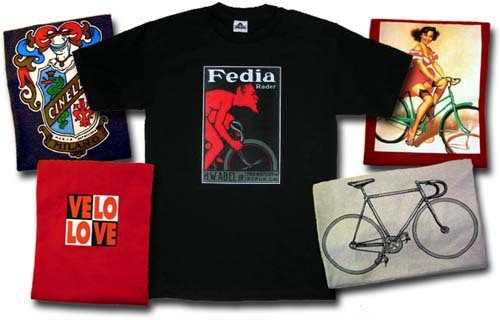 Images from the history of cycling printed onto high-quality t-shirts. Pick a shirt category from the T-shirt submenu to the left. FOREIGN ORDERS WELCOME! Please read the Foreign Shipping Info on the T-shirt FAQ page. Shipping is calculated AFTER you place your order and you will be contacted by email with the amount owed. WHAT'S NEW? The 1910s Bianchi Devil T-Shirt in the "Brands" section. CUSTOM? Dream-up your own custom T-shirt or custom musette and we will make it for you.